The Big Media Blog » Blog Archive » What can you do to fight fake news? Fake news is obviously one of the greatest threats to democracy, yet there’s little grassroots activism combating it. The focus is on what we can do to combat fake news, besides complain about it and hope Facebook and Google do something for us. 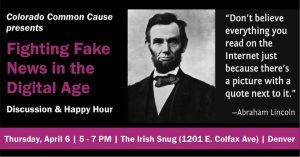 Join the fake-news discussion and happy hour Thursday, April 6, from 5 p.m. to 7 p.m. at the Irish Snug, 1201 East Colfax Ave. The program starts at 5:30. 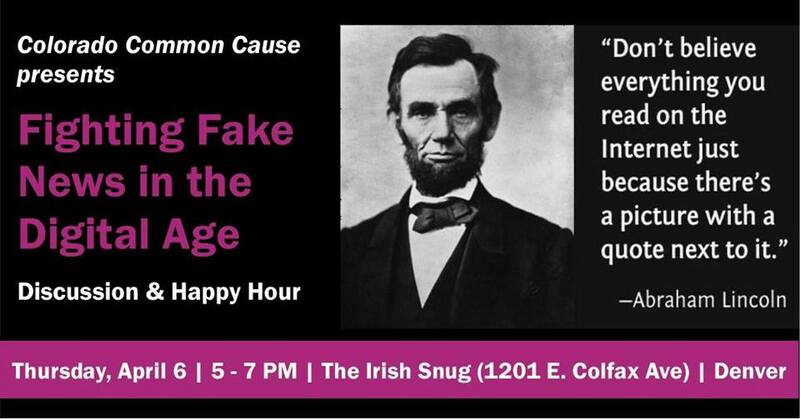 RSVP via Colorado Common Cause’s Facebook-event page or by emailing cfry@commoncause.org. By signing the pledge, lawmakers and citizens promise not to spread information, packaged somehow to look like news, on Facebook if it’s “deemed false or inaccurate by Snopes, Politifact, Factcheck.org, or by a respected news outlet.” If such information is accidentally posted, it will be removed unless “detailed reasons for not deleting it” are provided. This entry was posted on Thursday, March 30th, 2017 at 1:06 pm	and is filed under Facebook, fake news. You can follow any responses to this entry through the RSS 2.0 feed. You can skip to the end and leave a response. Pinging is currently not allowed.